Happily Ever Rushed: Valentia - Even glow eye serum. I was given the opportunity to work with Valentia on the Even Glow Eye Serum. I was very excited for this opportunity because it felt like lately that I was looking older than I feel. I felt tired but that is different than actually looking that way. 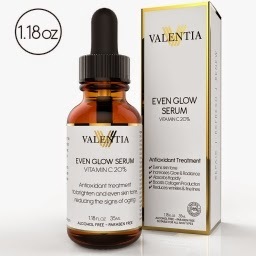 Valentia Even Glow Eye Serum is an Antioxidant Treatment that promotes and even skin tone, increase in glow and radiance, absorbs rapidly and boosts collagen production. The last and most important (to me) is that it reduces wrinkles and fine lines. I was impressed initially by the product packaging and the actual serum itself. It dries quickly once you use it and it feels good on the skin. I was struggling with the uneven skin tone issue lately and the Even Glow Serum really helped me with this issue. I am loving the new way my skin feels as well. My cheeks had been dry and it was a long winter so I really needed some help. I used the product at night after I cleaned my face and was ready for bed and this was a time that I felt was the best time for me. The Even Glow Serum also includes Vitamin C and the use of this can increase your immunity but it can keep your skin tight and reduce your chance of a sunburn and the redness that comes with that. This was a great product to work with and I would really like to work with them in the future. I will continue to use the product and when it runs out I will order some more. This would be a great for Mother's day and with Amazon you could probably still get it in time. Thank you Valentia for the chance to work together! I would love to try this I had never heard of it before now and it sounds just like what I need! Thank you for the review!